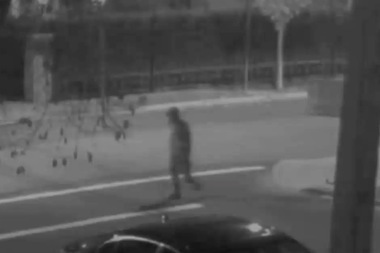 QUEENS — A new video shows the fire-starting "ninja" is possibly armed with a gun, police said. The man, who is suspected of setting seven fires in Forest Hills, was captured on home surveillance video walking on 112th Street near 68th Drive on Nov. 8 around 7:20 p.m., police said. About 10 minutes later, a fire broke out nearby in a vacant home at 68-60 112th St. The blaze, which spread to two other homes, prompting evacuations, was one of a series that began on Oct. 20. The fire on Nov. 8 at 68-60 112th Street spread to two nearby homes. In the video, the suspect has his face covered and is wearing gloves, police said. It also appears that he removes a gun from his left ankle and then transfers it to his front right pocket, according to the NYPD. The pattern started with a blaze at the former Parkway Hospital, officials said. Five of the seven fires targeted homes that are vacant or under construction and are owned by Bukharian Jews living in the Cord Mayer section of the neighborhood, between Jewel and 65th avenues and between Queens Boulevard and the Grand Central Parkway. Police described the suspect as being between 5-foot-6 and 5-foot-7, with a slim build. The man has been seen in several videos dressed in a hooded sweatshirt. Another surveillance footage shows the suspect wearing all black and "looking like a ninja," sources said. The NYPD has increased patrols in the area. Anyone with information is asked to call Crime stoppers at 1-800-577-TIPS (8477). All calls are strictly confidential.